Description: Following the Battle of Mine Creek, Maj.
Gen. Sterling Price continued his cartage towards Fort Scott. In late afternoon of October 25, Price’s supply train had difficulty crossing the Marmiton River ford and, like at Mine Creek, Price had to make a stand. Brig. Gen. John S. McNeil, commanding two brigades of Pleasonton’s cavalry division, attacked the Confederate troops that Price and his officers rallied, included a sizable number of unarmed men. McNeil observed the sizable Confederate force, not knowing that many of them were unarmed, and refrained from an all out assault. After about two hours of skirmishing, Price continued his retreat and McNeil could not mount an effective pursuit. Price’s army was broken by this time, and it was simply a question of how many men he could successfully evacuate to friendly territory. The Battle of Marmiton River (also known as Shiloh Creek or Charlot’s Farm) occurred on October 25, 1864, in Vernon County, Missouri during the American Civil War. 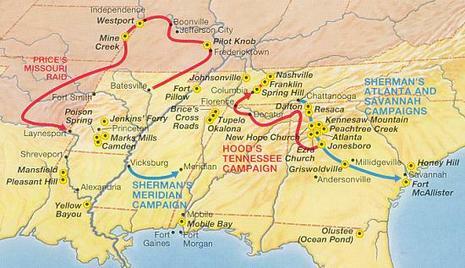 Following the Battle of Mine Creek, Confederate Maj. Gen. Sterling Price continued his cartage towards Fort Scott. In the late afternoon of October 25, Price’s supply train had difficulty crossing the Marmiton River ford and, like at Mine Creek, Price had to make a stand. Brig. Gen. John McNeil, commanding two brigades of Alfred Pleasonton’s Union cavalry division, attacked the Confederate troops that Price and his officers had rallied, which included a sizable number of unarmed men. McNeil observed the sizable Confederate force, not knowing that many of them were unarmed, and refrained from an all out assault. After about two hours of skirmishing, Price continued his retreat and McNeil could not mount an effective pursuit. Price’s army was broken by this time, and it was simply a question of how many men he could successfully evacuate to friendly territory.